2010 10k: "We believe that our transdermal gels minimize first pass liver metabolism, gastrointestinal effects and skin erythema. Other advantages include cosmetic elegance and ease of application as compared to transdermal patches and have potential applications in such therapeutic markets as hormone replacement, overactive bladder, contraception, pain management and central nervous system therapies." In November 2009, AIS sold this division to Ferring, resulting in a significantly reduced cash burn for the company. AIS has said that they were satisfied with their existing pipeline and thought they got better return on investment in the injector products division. 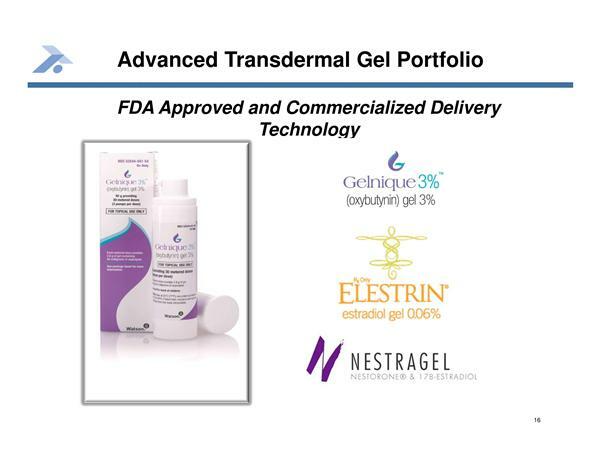 The sale does not affect current gel products in the pipeline, including Libigel, Elestrin, Anturol, Nestragel- AIS retains full ownership and financial gains. Gel contains a combination of the progestin Nestorone® and a form of estrogen, called 17!-estradiol (E2), which is chemically identical to the naturally occurring estrogen. Nesterone desirable because has no androgenic effects but not orally bioavailable and therefore cannot be used in oral contraceptive products. Partnership with the Population Council, who has also licensed a vaginal ring product of this combo. 2010 10k: "We are responsible for research and development activities as they relate to ATD formulation and manufacturing and the Population Council will be responsible for clinical trial design development and management. In 2010, we announced with the Population Council successful results from a dose-finding Phase II trial for the contraceptive gel. Together, we expect to identify a worldwide or regional commercial development partner as clinical data becomes available." August 2010: Pop Council in looking for a partner and has had preliminary discussions. November 2010 analyst presentation: in partnering discussions now, could find the resources to move forward but would prefer to partner. 3/14/11 4q2010 "looking for potential partner with Population Council"
3/7/11 at Cowen: product is "gearing up to go to next stage"
5/9/11 CC: Question re is AIS involved in BPAX Libigel business development discussions? We are in touch regarding future of Libigel, working with BPAX to ensure both companies get a good deal. Hope that any potential partner would want worldwide rights, so then AIS would have to be involved. Hope for significant partner fairly soon.